Graphene is typically present as a two-dimensional sheet. But researchers assert that tweaking this material to take more complex shapes will result in diverse properties and applications. For example, academics and industrialists can now make nanotubes out of graphene, which can function as transistors for next-generation nano-electronics. Other researchers hypothesize that graphene can also form spirals, which could also have a role as nano-inductors in the future. However, this possibility has not yet been made a reality...until now. A team of Japanese scientists has reported the synthesis of graphene helices, which contain the carbon nano-spiral. The researchers behind this project collaborated, on their new process for graphene helix formation, across the departments of Advanced Materials Research and Chemistry at the universities of Kyoto and Osaka. The team worked on the basic structure of graphene in order to induce the material to form a helical shape, using different chemical processes. The result was helicene (hexa-peri-hexabenzo -helicene), a form of carbon matrix that exhibits the kind of angles between individual atoms necessary to be considered a helix. To this end, the helicene produced was associated with a pi-extended structure with a considerable intramolecular pi-pi interaction. The researchers found that they could synthesize molecules with these attributes using relatively simple chemical processes! These molecules were initiated with a McMurry coupling reaction to produce a polycyclic aromatic hydrocarbon with helical twists. This process was followed by a series of steps involving photocyclodehydrogenation and aromatization to form helicene as a finished product. The helical properties of the resulting molecules were confirmed “unambiguously” through analysis with X-ray crystallography. The team was also able to examine their helicene using transient absorption spectroscopy at the femtosecond scale. They found that the molecules exhibited an excited state with a half-life measured in picoseconds, even in the lowest energy states. The researchers reported that the helicene molecules had a band-gap with exceptional chiroptics, as captured by X-ray analysis at 800 nanometers. At the 680-nanometer absorption level, circular dichroism (which indicates cyclical asymmetry, and thus, a molecular shape to form a spiral) of 0.016 was observed. In other words, the molecules were most likely to have a helical shape with interesting physical and chemical properties. The researchers behind the synthesis recorded their findings in a paper recently published in the Journal of the American Chemical Society. In this article, they point out that their new find may have applications as a nano-inductor. In addition, graphene helices may also function as a source of kinetic energy for next-generation nano-mechanics. They may act as ‘springs’ or primitive motors for machines (e.g., simple robots) at the sub-micrometric scale. These are exciting possibilities for the future of chemical and nano-engineering. Thanks to this breakthrough, it is looking more and more likely that scientists may be able to build more nano-electronic components – and maybe even whole devices – out of graphene with many different shapes and functions. 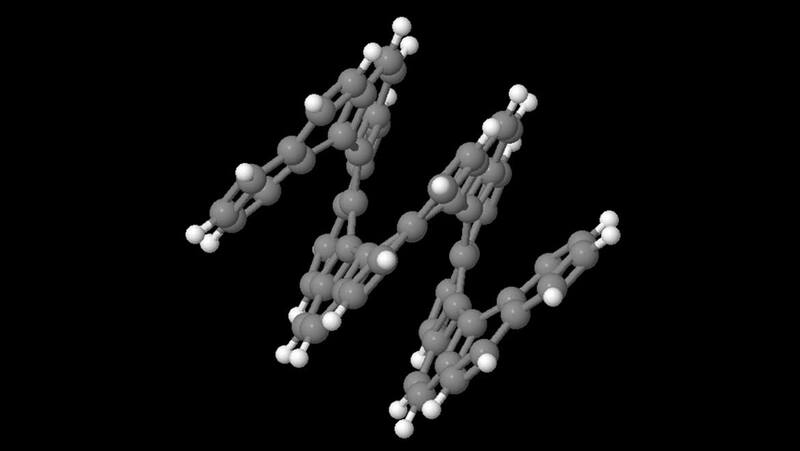 The successful synthesis of -helicene is also significant because it is made with a single helical twist, in line with simple, single-walled nanotubes that may be the future of transistor technology. Prior to this study, the best scientists could do in the area of carbon spirals were double helices. The increased complexity of these molecules meant that they were synthesized as various enantiomers and isomers (Conversely, the new -helicene was seen to have only two forms: one where helix has a right turn and one with a left turn). This issue necessitated additional steps such as separation before the individual molecules could be analyzed or used. Furthermore, the different ‘double-helicene’ isomers varied in terms of their properties and three-dimensional structure. Other groups have also produced quadruple and hexapole helicenes, using either - or -helicene), with similar complicated results (e.g., the hexapole molecule had a total of 20 isomers). Such molecules were prone to distortions in terms of their intermolecular, like pi, interactions. Additionally, these substances were found to have larger band-gaps compared to those of -helicene. All in all, the newest form of graphene helix appears to be more straightforward in terms of production and analysis. Therefore, it may be more amenable to use in the course of answering relevant research questions. A recent article has documented the synthesis of a novel helicene (graphene twisted into a spiral form) molecule, hexa-peri-hexabenzo -helicene. This material is a potentially ground-breaking innovation, and not merely because it involves the facile processing of a single layer of graphene into a helix. This new form of molecular carbon matrix may imply new possibilities in emerging areas of nanotechnology. Nakakuki Y, Hirose T, Sotome H, Miyasaka H, Matsuda K. Hexa- peri-hexabenzohelicene: Homogeneously pi-Extended Helicene as a Primary Substructure of Helically Twisted Chiral Graphenes. J Am Chem Soc. 2018;140(12):4317-26. Fujikawa T, Segawa Y, Itami K. Synthesis, Structures, and Properties of pi-Extended Double Helicene: A Combination of Planar and Nonplanar pi-Systems. J Am Chem Soc. 2015;137(24):7763-8. Hosokawa T, Takahashi Y, Matsushima T, Watanabe S, Kikkawa S, Azumaya I, et al. Synthesis, Structures, and Properties of Hexapole Helicenes: Assembling Six Helicene Substructures into Highly Twisted Aromatic Systems. J Am Chem Soc. 2017;139(51):18512-21. Fujikawa T, Segawa Y, Itami K. Synthesis and Structural Features of Quadruple Helicenes: Highly Distorted pi Systems Enabled by Accumulation of Helical Repulsions. J Am Chem Soc. 2016;138(10):3587-95.